Alternative Party 2002 was held at Kulttuuriareena Gloria in Helsinki, Finland. 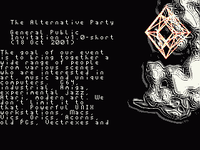 It was the 3rd Alternative Party. Results based on alt3rep.txt from scene.org.